There is no right to drive – not at a federal (constitutional) or at a state level). Therefore, the ability to drive on public roads is a privilege and not a right. As such, like any other privilege it can be taken away, amended, or limited. Your driver’s license can be suspended or revoked, for a wide variety of reasons. Driving under a suspended or revoked driver’s license is a crime in North Carolina that can be punishable by jail time, fines, and extending the time of your suspension. Luckily for some people who are in this situation, there may be a possibility to get a limited driving privilege. 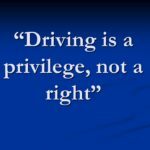 As the name points out, this is also a privilege since it is at the Court’s discretion whether or not a limited driving privilege is issued. A North Carolina traffic attorney, or a North Carolina Criminal defense attorney, will typically be able to help you with this and other driving related matters. What are common reasons why driver’s licenses get suspended or revoked? What is a limited driving privilege? A limited a driving privilege is a court issued order that allows the holder to drive under certain restrictions. They typically have limits with regards to the hours the person can drive, where the person can drive, etc. Often, limited driving privileges are issued for the purpose of the person being able to drive to and from work or school. Can I always get a limited driving privilege? No. There are certain instances where a limited driving privilege is not an option and a citizen isn’t allowed to drive in the state of North Carolina anymore. In North Carolina the most common occurrence of this is when someone has multiple DWI convictions and they get a permanent revocation as a punishment. How do I show proof of my limited driving privilege? If you are issued a limited driving privilege, you will receive a copy of a signed order by a judge, granting such privilege. This should be carried with you when you are driving, just like you would a driver’s license. That document will have the terms and conditions of the limited driving privileges and you can show it to a police officer in place of your license (since you won’t have an active one) if you are ever pulled over for a traffic infraction. How do I get a limited driving privilege? You should hire a lawyer. An attorney can do the necessary research to find out if you are even eligible for a limited driving privilege, and he or she can gather all the necessary documents to determine the applicable statute that your particular situation falls under, and get a judge to sign the order issuing you a limited driving privilege. At Gilles Law we handle Limited Driving Privileges as a well as a wide variety of other traffic law and criminal law matters. Contact us.